Tours are available for schools and universities to a number of our facilities. Our tours will allow you to learn more about Westernport Water’s water supply and sewerage treatment processes. Our interactive and educational classroom incursions allow students to learn about a range of water topics, including the water cycle, water supply, recycled water and water conservation. 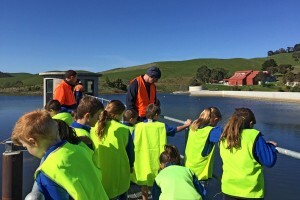 We have two types of tours available to schools and universities where students can learn about everything from the local water supply and drinking water catchment to sewage and recycled water treatment. Gives students from grade 3 to year 8 an appreciation for their local tap water and is suitable for learning about the water cycle, catchments, drinking water and the environment. The tour of Candowie Reservoir and treatment plant incorporates the reservoir, dam wall, spillway and outlet tower plus a walk through the plant to see how our drinking water is produced. The tour is both indoor and outdoor and takes around 1 hour and we can cater for a maximum of 30 students at one time. Visits the recycled water treatment plant that treats all the sewage from the Phillip Island and San Remo area, and produces recycled water and biosolids that is reused in the community. The tour takes around 45minutes, and includes a walk around the plant to see the sewage treatment process, recycled water treatment, production of biosolids as well as a short trip to Pyramid Rock to see the ocean outfall. 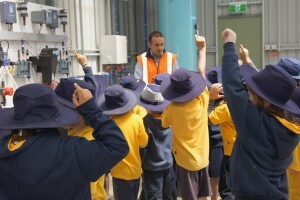 This tour is suitable for learning about water conservation the environment and sustainability. Our tours are provided free of charge to schools in our service region. Schools must organise their own transport to and from all sites.